As recommended by the American Nurses Association (ANA), within the nursing profession, including professional and specialty organization, there is a responsibility to members to define the scope and standards of practice. This work provides the basis for further descriptions and refinement of work. Included below are documents with information about the role of the Advanced Practice Nurse in Pediatric Gastroenterology. As a specialty organization, gastroenterology nurses would benefit from additional research and publication about the scope and standards of practice for nurses and advanced practice nurses. One specialty organization who has published a number of documents than can be helpful in defining scope of practice is the National Association of Pediatric Nurse Practitioners (NAPNAP). Just one more reason to take advantage of our joint membership opportunity. ANA and a workgroup of pediatric nurse experts, from across their specialty and representing seven professional organizations, convened to update and expand the 2008 edition to accommodate ongoing and anticipated changes in their specialty and health care. 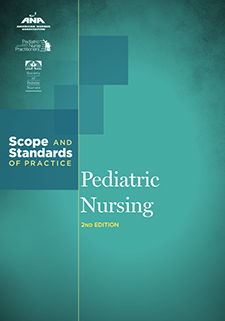 With input from numerous nurses, they developed Pediatric Nursing: Scope and Standards of Practice, 2nd Edition. It is a comprehensive delineation of the competent level of practice and professional performance common to and expected from pediatric registered nurses in all practice levels and settings. The publication’s scope of practice addresses what is expected of all pediatric nurses, specifying the who, what, where, when, why, and how of their practice. That detailed discussion of the scope of practice gives the context—the underlying assumptions, characteristics, environments and settings, education and training requirements, key issues and trends, and ethical and conceptual bases of pediatric nursing—needed to understand and use the standards. A foundational volume that is primarily for those directly involved with pediatric nursing practice, education, and research, other nurses and allied healthcare providers, researchers, and scholars will find value in this content. It is also a resource for employers, insurers, lawyers, policy makers, regulators, and stakeholders involved in pediatric care. The American Academy of Ambulatory Care Nursing has released an updated - 2017 position statement: American Academy of Ambulatory Care Nursing Position Paper: The Role of the Registered Nurse in Ambulatory Care. Please follow the following link to review the full article.